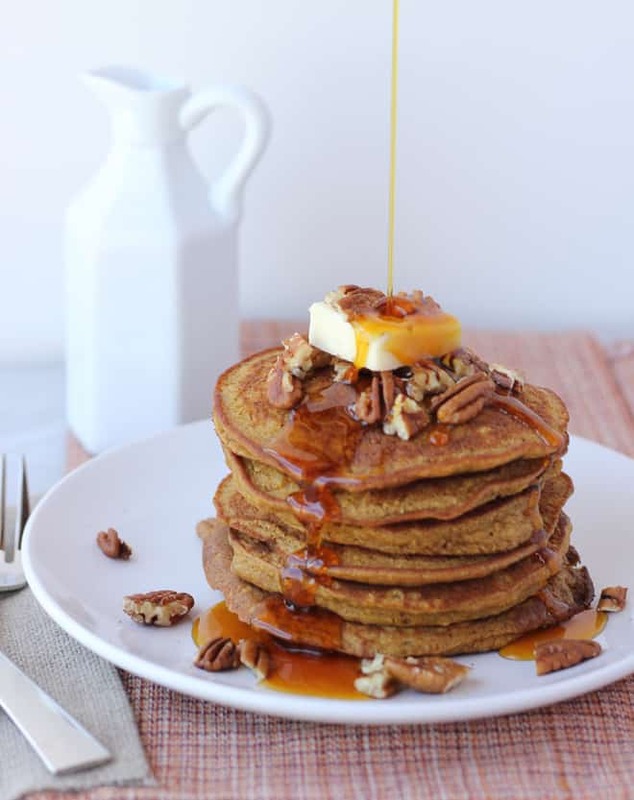 Healthy Pumpkin Oatmeal Pancakes! Lightly sweet from applesauce, full of fall spices and vitamin-rich pumpkin. Made with ingredients you already have around. A kid-friendly fall breakfast! My husband and I love to make breakfast together on Saturday mornings. He is usually in charge of all things meat or egg related, while I take on the baked goods or pancakes/waffles. Last Saturday I had some leftover pumpkin in the fridge, just waiting to be made into something delicious. 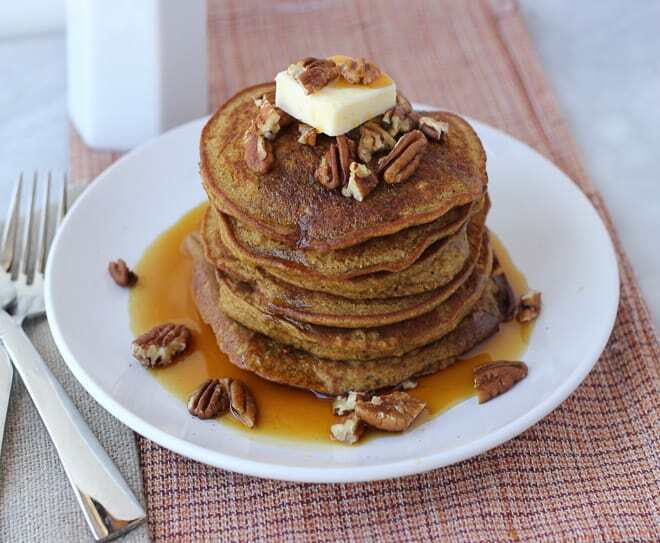 The result was these easy and fantastic pumpkin oatmeal pancakes. I know I can be dramatic about food, but these are seriously delicious! They are fluffy, full of fall spices, and healthy. They are lightly sweet from some applesauce and full of vitamin-rich pumpkin. I have been dreaming of making them again ever since. When working with regular rolled oats, I like to add some buckwheat groats to the mix to help make the oats easier to digest. Buckwheat groats are high in phytase, which is a good enzyme that helps break down phytic acid in grains. Regular rolled oats have many wonderful health benefits, but also contain a large amount of hard-to-digest phytates and other anti-nutrients. I grind up oats in the blender to make oat flour (the pre-ground kind at the store is often rancid) and it is really easy to throw in some buckwheat groats along with them. These two are a match made in grain-heaven! However, if you don’t have buckwheat groats you can just make these with an additional 2 tablespoons of regular oats. These might just be gracing our table again next weekend. 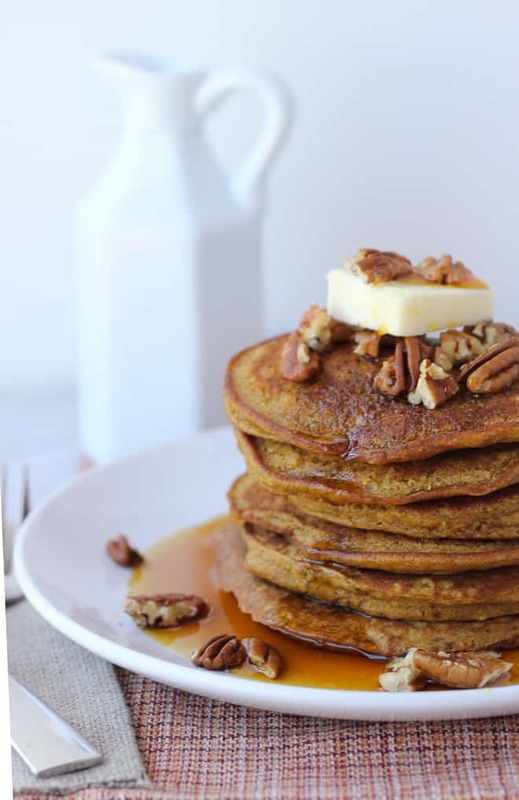 I would take pumpkin oatmeal pancakes over regular pancakes any day. They are that good! Process the oats and buckwheat groats in a high speed blender until finely ground, about 60 seconds. Add the spices, salt, and baking soda. In another bowl, whisk together the pumpkin, milk, coconut oil, maple syrup, vanilla, and eggs. Add the wet ingredients to the dry and stir until just combined. Do not overmix. Heat a non-stick pan or cast iron skillet over medium heat (or 350F for an electric griddle). Lightly oil or butter the surface. Once the pan is hot, pour 1/4 cup amounts of the batter and gently spread into circles.Cook until bubbles form around the edges of the pancake. These pancakes take slightly longer to cook than regular pancakes so just keep the heat on medium and give them some time. Flip and cook for another 2 minutes on the other side. 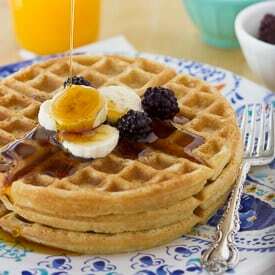 Serve warm with maple syrup! Enjoy! Sounds like breakfast to me! I love pancakes (that is an understatement) and these just look so fabulously healthy! 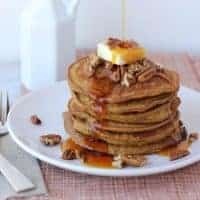 Re Pumpkin Oatmeal Pancakes recipe….I don’t have raw buckwheat groats but do have buckwheat flour on hand. 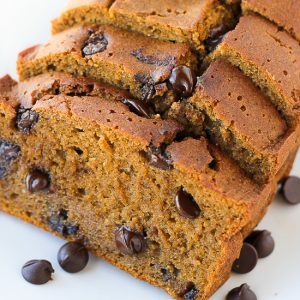 Can I just use buckwheat flour and if so should I use 2 tablespoons? I was diagnosed gluten intolerant in June. At first I thought it would be a nighmare but it has not thanks to blogs and websites such as yours. Thanks so much! Yes the buckwheat flour should work fine! Delicious! I’m not sure I’d describe them as “fluffy” though. I think I’ll try without applesauce next time to make them a little less heavy. how many pancakes does this recipe make typically? Can’t wait to try it! This usually makes 7-8 pancakes! One batch can feed 2-4. These are fabulous. I have made them with 1 cup pumpkin and leaving put the applesauce. We also add blundered and blackberries to them. Currently I am cooking some with 4 whipped egg whites folded in instead of 2 eggs. Thanks so much! I am so excited to come across your recipe! These are so much healthier than a mix. I was happy to learn that I could grind my own gluten free oats and not have to use rice flour. They are delicious! I didn’t have vanilla on hand, so I substituted a tsp. of brandy. . Served with sliced banana, toasted pecans and pure maple syrup. Thanks for posting your wonderful recipe! Sounds delicious! I’m glad you liked them! The recipe is too “wet”. They never really cooked through and were hard to flip. In hindsight, I would omit the appleasauce ad use another form of sweetener. Sorry they didn’t work out for you! Did you use all oats or oats and buckwheat groats? I always use part buckwheat groats and they turn out great. I’m wondering if using all oats makes them too wet. Thanks for your feedback! These were so yummy! I’m sorry it’s impossible for me to follow a recipe exactly…. 😉 I used the oats and instead of buckwheat I used almond flour. I used 2Tbs of ground flax seed to replace the eggs, although aquafaba would have worked too. switched the measurements of the applesauce and pumpkin because my guy hates pumpkin. Added a pinch of cinnamon instead of other spices and extra rice milk to thin. Thank you so much for the awesome recipe! Next time we will try to put a little molasses in it and dip in whipped cream to liven the taste. Thank you very much, Erin! That sounds delicious! Glad you like it! So good! I used two chia eggs instead, and just the whole amount of oats instead of the buckwheat groats. Topped them with coco-whip, and they were a hit! Thanks! These are great! I used all oats because I didn’t have buckwheat in hand. Kids loved them! Thanks for a great recipe. such a filling breakfast! Hearty and sweet.